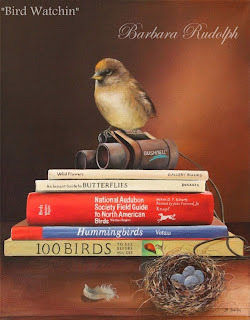 Barbara Rudolph Fine Art: Painting Birds - "Bird Watchin"
Painting Birds - "Bird Watchin"
Just finished! "Bird Watchin" This oil painting is a little sneak preview of the direction I am working in for the next "Celebration of Fine Art" 2011. This little bird is sitting upon a stack of field guide books and binoculars. He is the one doing all of the "watchin." "Bird Watchin" was painted on 14x11" canvas and is framed. I will be offering it in a small giclee edition as well. I will also have several more in the near future from my "murder mystery" series, so stay tuned in! Your paintings are awe inspiring. I love this painting. Love the direction that your work is taking. Beautiful. Icon contemporary painting "The Messenger"
Oil Spill Disaster "How You Can Help"